Bus from Ipoh to Shah Alam plays an important role to connect residents between the two cities. That is because popular ETS train service does not cover Shah Alam area. ETS train from Ipoh to Kuala Lumpur terminates in KL Sentral. Plusliner is the one and only bus operator that offers bus service from Ipoh to Shah Alam. Plusliner provides 6 to 7 daily departures from Ipoh to Shah Alam. The first bus service starts from early morning 7.45am and the last bus leave the departure point at 7.45pm. Plusliner is a brand under KTB group controlled by government. Therefore their service is guaranteed. In fact, Plusliner is the popular choice among locals for taking bus. 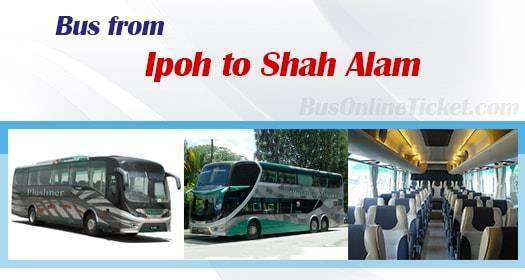 The duration required for bus from Ipoh to Shah Alam takes about 2.5 hours depending on traffic and climate condition. The bus fare of bus from Ipoh to Shah Alam is RM 23.70 for adult and RM 17.80 for child. After the closure of Medan Gopeng Bus Terminal, the current boarding point for bus from Ipoh to Shah Alam is at Aman Jaya Bus Terminal. Passengers can easily get to Aman Jaya Bus Terminal by taking a 30 minutes taxi or city bus from Ipoh city center. The arrival point in Shah Alam is at Terminal Bus Shah Alam Seksyen 13. Washroom break will be provided upon request to driver during the journey because all buses in Malaysia has no toilet facility in the bus. Even though there are frequent bus service available for bus from Ipoh to Shah Alam, passengers are advised to purchase their bus tickets online through BusOnlineTicket.com. Our online ticketing portal is available 24/7 any time and every day. You can book your bus ticket online now from our official website BusOnlineTicket.com or via mobile app which can be downloaded for free on App Store or Google Play.